If you love a little sparkle and are looking to take your jewellery making to the next level then this is the perfect workshop! During this intensive full day workshop you will be learning 2 invaluable stone setting techniques that will have you incorporating beautiful faceted gemstones into your jewellery designs. Tube setting is a method of setting round faceted gemstones. This is stylish way to incorporate colour & beauty of gemstones into your jewellery designs and a fantastic first step towards more complex gemstone settings. Flush setting is the technique whereby a facet bet stone is set into a piece of jewellery so that the table of the stone is flush with the surface of the metal. Flush setting is a great alternative to having raised setting such as a bezel, tubes or prongs, adding a sleek look to your designs. Please Note :: This workshop is for people with confident basic silversmithing skills or those who have attended previous workshops (soldering skills required - please email if in doubt). 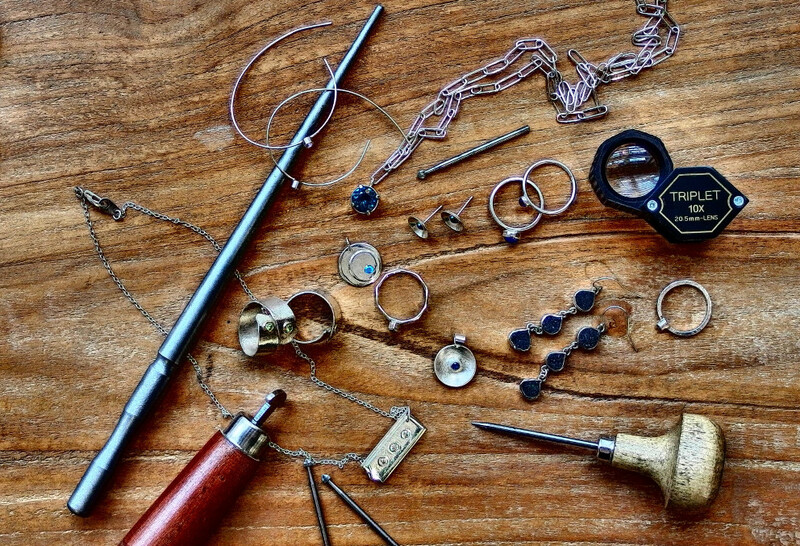 Skills taught :: Measuring and selecting gemstones, using a drill press or pendant drill rilling, seating faceted stones, using burrs, burnishing, sawing, filing, sanding, finishing. £110 inclusive of all materials for set project*, cubic zirconia gemstones**, tools and plenty cups of hot coffee and tea. *If you would like to make a larger project silver is available for purchase on the day. **If you would like to use real gemstones there is a selection available for purchase on the day. There will be a break during the day. Please bring a packed lunch with you as shops are a little too far away for the time allocated.